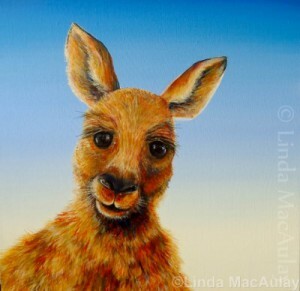 A small sample of recent paintings and prints for sale by Australian Artist, Linda MacAulay. 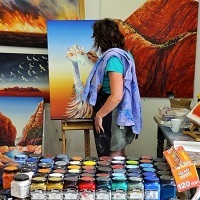 Please visit the Individual pages to see complete galleries of her latest acrylic paintings, painted saw blades, humorous emu prints or prints of Melbourne. Recently I set about exploring and painting the American Southwest in watercolour. Click here to read more about my latest painting adventure. 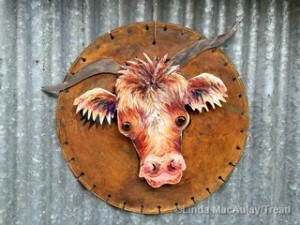 Linda MacAulay has been working with Tim Read from Tread Sculptures to produce a range of outdoor garden artworks using recycled rusty metal. 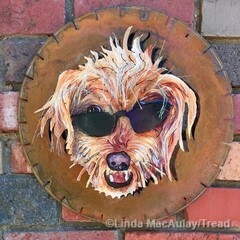 View these artworks at Tread Sculptures Gallery along with some of Linda’s acrylics on canvas in the Bend of Islands on the first weekend of every month. 10 – 4 . Catch Linda at Tread on Sunday the 6th of May 2018 between 10 am – 4 pm. In May of 2017 I was honoured to be selected to be the Artist in Residence at Kings Bridge Cottage which overlooks the Cataract Gorge. 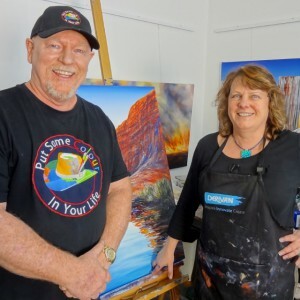 The residency is managed by the Queen Victoria Museum and Art Gallery on behalf of Launceston City Council and aims to provide artists with time away from their usual lives to create a body of work that is inspired by their surroundings. Click post to read more about the project. 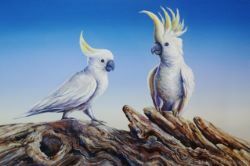 Artist Palette Magazine 2016/17 yearbook features a 10 page article on the work of Linda MacAulay including a step by step demo of this painting “Local Royalty”, an interview with Linda and loads of handy painting hints. 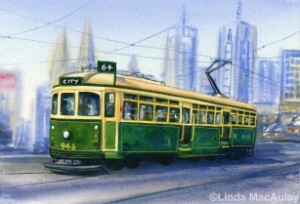 Learn about using “wet on wet” in acrylics, glazing and much more.